September on the beautiful blue Danube should be on everyone's bucket list. 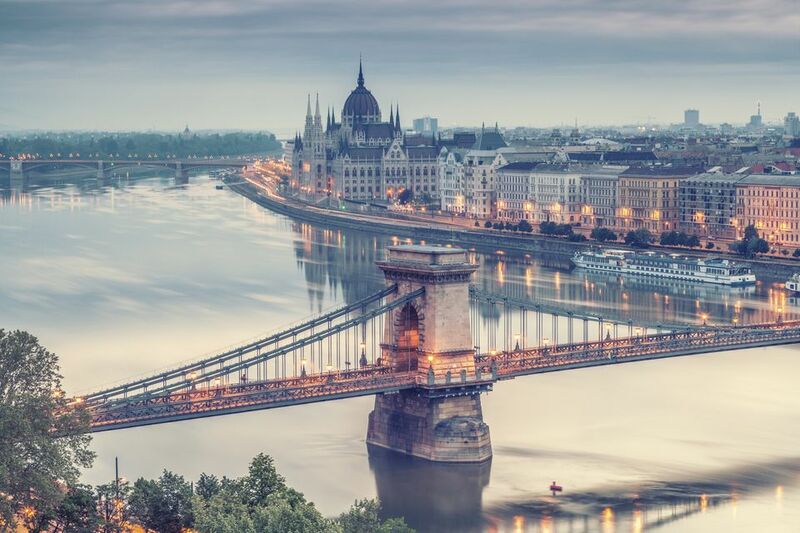 The two sides of the city called Budapest, Hungary (Buda and Pest), straddle the Danube, and it's an ideal place to fulfill this once-in-your-life travel goal. It's especially easy to linger around Budapest's renowned art nouveau architecture and Roman ruins when the weather is mild and sunny. Same goes for hanging around at outside tables at cafes, restaurants, and pubs. Bottom line: The weather could not be more enticing. September starts out with average highs around 76 degrees Fahrenheit; that falls to afternoon highs around 67 by the end of the month. So the entire month gives you guaranteed comfortable weather during high sightseeing times and during the early evening, so eating alfresco is still possible even though summer is on the wane. Low-temperature averages go from 56 degrees at the start of the month to 48 degrees by Sept. 30. But these are middle-of-the-night temperatures and won't affect daily doings; they just keep the daytime comfortably warm and not hot. September is also a relatively dry and sunny month, with it getting progressively more likely to be cloudy as the month goes on. The average September rainfall is only about 1.5 inches, so you will almost certainly not need an umbrella. But don't forget your sunglasses. This mild weather makes it easy to pack for a trip to Budapest in September. Take along jeans (not your heaviest ones) or khaki pants. Capri pants are also an option, especially if you're going to be there in early September. Pack short-sleeved shirts and tops and a poncho, light cardigan, wrap-like cardigan, or cashmere wrap that all work together color-wise so you can add a layer in the evening after a warm day when all you need is a short-sleeved top. A cotton pullover sweater would be a good addition for a change or if you experience a few cooler-than-normal days. This also can be layered with a cardigan or poncho. Cashmere wraps are a terrific travel item since they take up very little space in your bag and make you look chic, no matter what else you have on. Great for going out to dinner at a nice restaurant as the temps start to fall. As is true for all European trips, you will do a lot of walking, so take shoes that are comfortable; during September those could be lightweight canvas summer shoes like espadrilles, flats, or sandals that have at least some support. You'll need to be closed shoes at night for warmth so if you can't do without sandals when it's in the 70s, take along something warmer, too. The Jewish Summer Festival includes movies, music, dance, art and literature that shine a light on Jewish culture. It takes place at the Great Synagogue on Dohany Street, the second-largest synagogue in the world. The Budafok Champagne and Wine Festival is a tremendous tasting experience for all, as is the Budapest Wine Festival. For something completely different, check out the Fois Gras Festival. If you have a sweet tooth, your favorite fest might be Sweet Days -- Chocolate and Candy Festival. And if you love the Run for the Roses in the U.S. in May, you will surely enjoy the National Gallop, a horse race that emphasizes Hungarian traditions.